Outside Lands is known for its wide variety of “gourmet” food options. In previous years, the festival has included Chocolate Lands, Beer Lands, Wine Lands, Cheese Lands, as well as their classic Food Trucks. The list of delicious options doesn't fall short, so check out this link for some of the foods will appear at Outside Lands 2015. Italian bread filled with spaghetti and marinara. Crispy fries generously topped with garlic, herbs, and salt. A melted chocolate bar topped with toffee bits, mini chocolate chips, cacao nibs, and almonds. Beer with a sweet hint since graham crackers, chocolate malt, and toasted marshmallow flavor are used in the brew-making process. Coachella provided a wider variety of foods for their 2014 festival, however Coachella does serve more of the typical festival foods. Foods like Greek gyros, pizza, burritos, and orange chicken can be found to satisfy your hunger. However, there are more advanced options available to festival-goers who want this option. Orange glazed chicken served over fried rice and chow mien with a spring roll on the side. It’s simple. Tacos filled with short ribs. However, this option is only found in the VIP Area and Beer Gardens. A quesadilla filled with meat, Mexican cheese, and roasted garlic sauce. During Coachella 2014, the weather fluctuated around 90 degrees both weekends in desert-like terrain of Indio, California. To cope with this heat, attendees of Coachella are seen in a variety of crop tops, high-waisted shorts, as well as flowy dresses and skirts. Hats and sunglasses are a popular addition to the stylish outfits. During Outside Lands 2014, it was a brisk 68 degrees all three days of the festival--fairly typical weather for this festival that takes place in San Francisco, California. A little bit of a cooler twist to festival fashion, Outside Lands goers bundle up in jeans, scarves, and big jackets. You may be asking yourself, “Where in the world is Indio?” Indio, California is located in Coachella Valley, just about an hour east of us here in Redlands. It is only about a 30 minute drive to Palm Springs and about two hours away from Los Angeles. If you make a trip over to Palm Springs, be sure to stop by the famous “Great Shakes” for a to die for shake or malt. San Francisco is the hub of the Bay Area with lots to do when you’re not enjoying the tunes of Outside Lands. The festival takes place in Golden Gate Park, so you’re a quick drive away from the iconic Golden Gate Bridge. While in the city, you definitely want to check out Ghirardelli Square, home of the decadent chocolate treats, Pier 39, a hotspot of shopping and dining with a nice view of the bay, as well as Alcatraz, the famous prison. Both festivals have brought a diverse range of amazing artists every year. Some of the big headliners for Coachella 2015 include Jack White, Drake, and AC/DC. Sub-headliners include Florence & the Machine, Tame Impala, and The Weeknd. 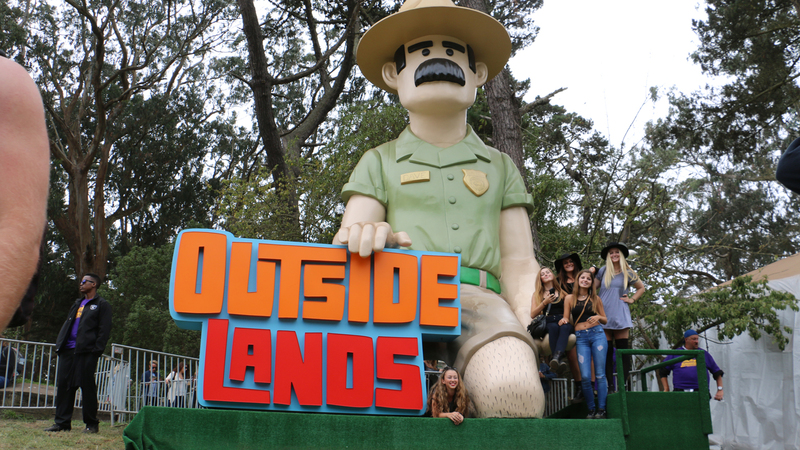 The Outside Lands 2015 lineup includes headliners Black Keys, Mumford & Sons, Sam Smith, and Kendrick Lamar. Sub-headliners consist of Tame Impala, Axwell & Ingrosso, and Porter Robinson. This really comes down to your own personal opinion and music taste, but one thing’s for sure; both festivals never disappoint with the artists. Both festivals have an array of beautiful art pieces and visuals that can be enjoyed. Coachella is known for its iconic ferris wheel that can be seen in most Coachella photographs. In 2014, Coachella displayed a giant astronaut sculpture called “Escape Velocity”. The “Reflection Art” piece reflected everything from concert-goers to the reflection of the sky. The most iconic visual seen at Outside Lands is the windmill gate located virtually in the middle of the festival. Outside Lands is a Music and Arts festival, and the festival grounds definitely don’t disappoint with the art pieces. Around the Outside Lands grounds, you can check out the art done by native San Francisco artists, known as “Outsider Art.” You never know what to expect since the paintings are done live and put up daily each day. When you’re not listening to the extensive acts featured at Coachella, there are plenty of activities you can take part in around the venue. There are many games such as a 3 legged race, 4 corners, ping pong, and dodgeball. You can also relax and get a massage, do some yoga, or make some art at the art studios. If you’re coming from a farther distance, you can also camp out on the Coachella grounds. As mentioned above, you can take a break from the music and enjoy the art pieces all around. Even better, you can watch the live painting done daily if that’s your cup of tea. Another section of Outside Lands is called “The Barbary.” In the Barbary, you’ll find a mirror and stained glass-lined tent filled with different comedy and storytelling acts. Beer Lands and Wine Lands gives concert-goers the opportunity to try a wide selection of finely crafted beer and wine while winding down and relaxing. If both of these festivals are out of your price range or inconvenient, we have one more option for you. Lightning in a Bottle is a smaller festival that is less expensive, but can give you a similar experience to Coachella and Outside Lands. Lightning in a Bottle takes place in Bradley, California near Monterey in Northern California from May 21-25th this year. Some of the big names that will be playing this year include Flume, Odesza, RL Grime, SBTRKT, and John Digweed. A full weekend ticket only costs $260, a bargain compared to the $300+ tickets for Coachella and Outside Lands. Lightning in a Bottle is a unique experience in the way that it provides many other activities besides music. The Do Art Foundation, a non-profit arts organization, creates paintings that are displayed throughout the course of the festival. Concert-goers have the opportunity to buy the art works to keep as a remembrance of the festival. The Lucent Temple of Consciousness, which is considered the heart of the festival, provides concert-goers with a spiritual experience. Speakers come and provide workshops such as nutrition classes and demonstrations to teach people about the fundamentals of health as well as ancient and modern cooking traditions. Yoga, dance and meditation sessions are provided from sunrise to sunset to encourage balance and empowerment for a spiritual experience. All three of these festivals will be an irreplaceable experience that will fill you with memories. Music lovers have the opportunity to engross themselves with live music while being surrounded with other music lovers with the same passion for music. Your options for music festivals are limitless, so pick the right one for you, and have a music filled summer!